Guess what’s hot, bold and trending? If it’s 2019, it must be metal. Pantone, the global expert on colour trends, predicts bright pops everywhere in 2019 along with delicious tones influenced by what tempts our taste buds and our senses. When applied to perforated metal sheets as a finish, this means the freedom to choose from the entire spectrum of colours. PantoneView Homes + Interiors 2019 reveals 72 on-trend colours across eight aptly-named colour palettes. ‘Cravings’ features rich reds, sweet oranges and vibrant purples, mixed with cappuccino, chocolate neutrals and grassy greens. At the opposite end is ‘Classico,’ featuring sophisticated, muted tones of white and camel, paired with teal, soft grey, burgundy red and deep black. Pantone’s colour predictions are for interior spaces but these shades will, no doubt, flow into exteriors too. Will we see balustrades, feature walls and facades turning heads in a bright spicy red? Some architects and designers are already going bright and bold with their colour choices. 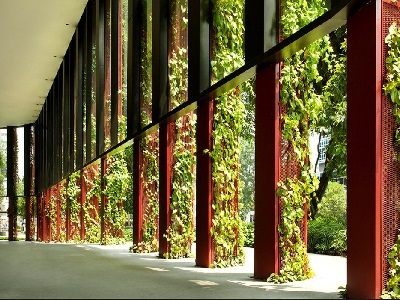 This year’s winner of the Best Tall Building, the Oasia Hotel Downtown Singapore combines a bright red metal façade and a lush green wall to soar ahead in on-trend colour and style. The Blacktown Tennis Centre and Narellan Town Centre shopping mall – both Arrow Metal Systems projects – also feature vibrant red, as a feature mural, balustrade and play area fencing. Sydney Design School steps away from neutral shades, with their creations coming out in a strong simple colour, marking a return to individuality through bold tones that bring spaces to life. Coastal blues, utilitarian greens, gender neutral purples, yellow and red are predicted to be the colour trends of 2019, either as accent colours or statement spaces. While there may not be too many takers for a yellow metal façade, the bright colour will work indoors. Take a look at this sunny staircase in a residential home designed by Melbourne architects Taylor Knights. Whatever your preferred shade, Arrow Metal Systems can add any colour to perforated metal, including custom tones to match branding requirements.